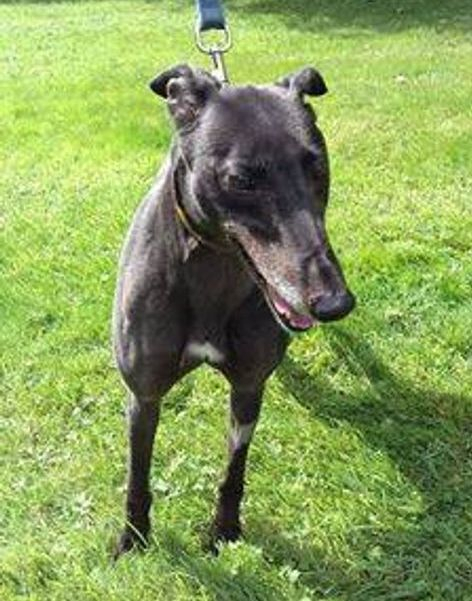 Hello everybody, my name is Dora and, like many of the greyhounds at Bristol DAWG, I was rescued from who knows what fate by a lovely lady called Eila who sent me across the Irish Sea with some other dogs to seek our fortune. I'm quite dainty and petite for a greyhound and Hilly says I'm very pretty, although I'm blushing to the roots of my fur telling you that. Unfortunately black greyhounds are less popular than the other colours, but you'll wonder why when you see my lovely glossy fur. In fact, I'm in very good condition and Diane, who sometimes walks me, says I'm extremely good on the lead. So you can see, I've got an awful lot to offer when I find my forever home - could that be with you? If you'd like to make an appointment to meet me, please get in touch, I'm looking forward to it, but please bear in mind, I would like to be an only pet.